Are you looking for a delicious recipe for those pork ribs you bought the other day? 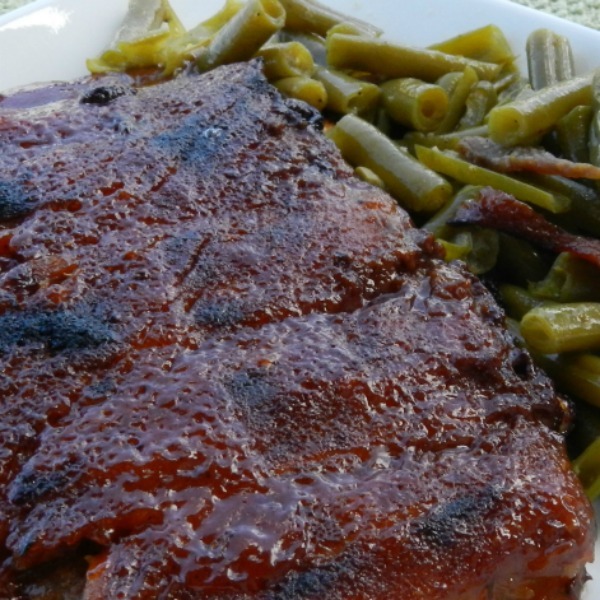 Then you'll definitely want to try this twist on traditional ribs, my Sweet and Spicy BBQ ribs. October is also National Pork Month, so what better way to kick it off than with a new favorite recipe? Our family loves ribs and Mom and Granny have their own twists on this dinner staple. After a long day working on the farm, my Grandpa and brother always enjoy these. Speaking of the farm, our beef cows are sure enjoying the fall weather. Western Washington summers are generally pretty mild with low humidity (especially compared to Indiana), but with the drought this year, it's been a lot hotter. Without much water, pastures dry up quicker. Beef cows graze on pasture. My brother is a hay farmer, so even though he got an early start this year due to the nicer weather, it does start to cause some problems near the end of summer. This means that we make sure the cows have more hay available to them in the manger to snack on. And lots of water. The water troughs are always full. Back to these yummy ribs! You can use whatever barbecue sauce you like. I mixed a spicy honey version with a hawaiian barbecue sauce. Oh my gosh was it good!! I do a lot of canning in the summertime, so I served it with some canned green beans and bacon. Perfect dinner. Sounds good. Do you have a beef rib recipe to share?. It's delicious! I've used the same recipe on beef ribs before too...both are really good! Thanks for the invite! Where was your hog farm? It looks so tasty! My whole family loves pork ribs. Mu husband will totally like the recipe. Thank you for sharing!